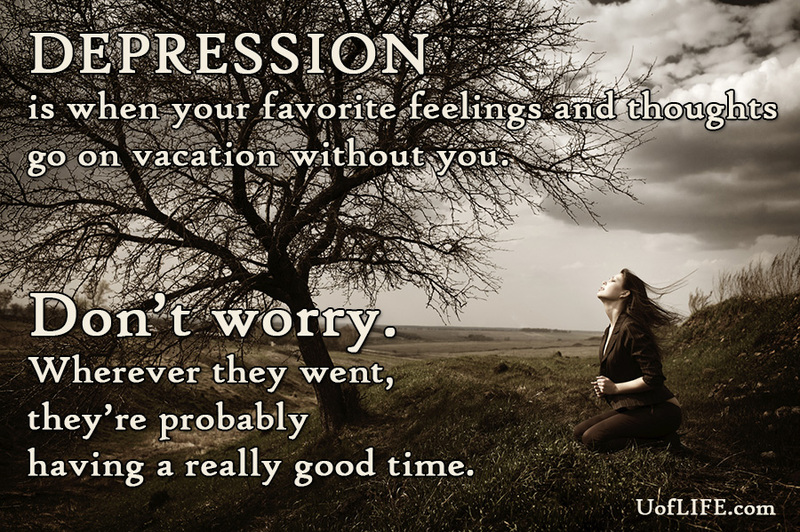 Depression happens when life tips too far away from the light for too long, and your heart and mind take a partial vacation. Depression is a safety valve, like when you turn on too many appliances in your home and blow a fuse. If your system didn’t partially shut down, your overloaded circuits would have experienced a worse melt down later on. This explanation is so helpful because it reveals exactly how to treat depression – simply reduce/remove as many dark items from your life, add/increase as much light as you can, then hang on as the pendulum slowly, steadily swings back toward happiness. You will experience immediate results as you re-balance your life toward the light. You will begin to feel lighter and even catch glimpses of your former happiness. It’s important to give yourself credit for every tiny step you take in the right direction, which increases your confidence that you can take yet another step, then another, and another. On the other hand, don’t worry if completely escaping depression takes time. It usually does. It usually takes time to learn the lessons and develop the habits that may have prevented depression in the first place, but without a slip into the dark side, you may not have realized how much you needed to learn/acquire them. Recovery usually happens slowly, like the changing of the seasons. Like sap slowly returning to tree branches after a long, dreary winter. Tiny green leaves steadily unfold, rolling slowly out of bud, and drink in the sunlight. Then one day, seemingly abruptly, you open your eyes and discover that days have grown longer and warmer, and spring has arrived. Until then, keep on tipping your balance back toward the light any way you can, and share this article with any friends who could use more light in their lives.